Dade City, FL (February 6, 2018) – Chester Weber, a Florida native who is known around the world for his success in Four-in-Hand driving, kicked off 2018 in the only way he could have been expected to – with a win in his first competition of the year. 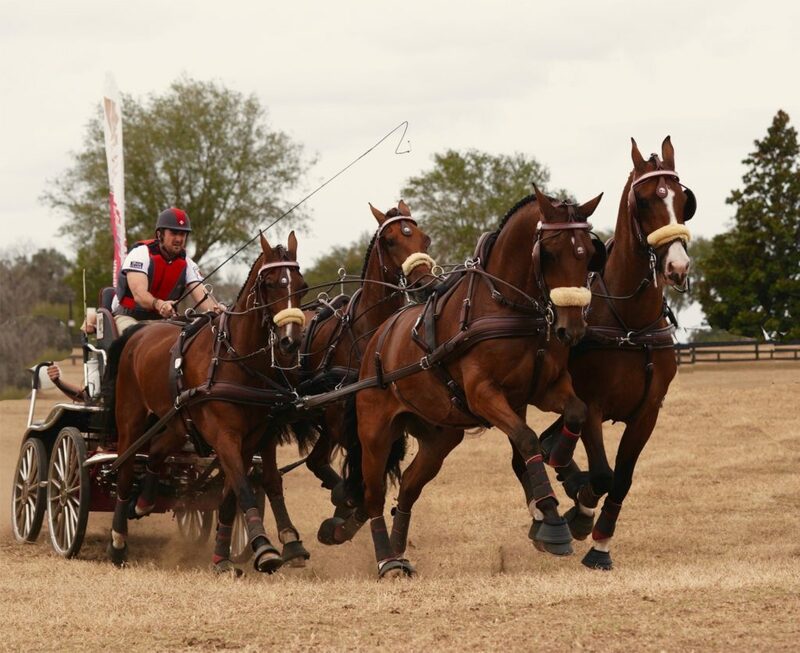 After spending the winter competing in major driving tournaments throughout Europe, Weber touched down on U.S. soil to claim the top spot in the CAI 2* Palm Tree CDE Four-in-Hand division in Dade City, Florida, on January 25-28. For the remaining phases, Weber was unstoppable with the matched team of KWPNs owned by him and Jane Clark. He kept First Edition in the left lead for all three phases, with Boris at the left wheel and Asjemenous at the right wheel. After the dressage phase, he replaced Splash from the right lead with Reno. The team won both the cones phase and the marathon phase to earn the overall first place score of 155.79. Reno, a newer member of Team Weber, certainly fits in with the talented group. “Reno has an interesting pedigree; he’s half Friesian and half Orlov Trotter,” said Weber. “This was his third competition with me. He was perfect. He’s a great addition for the team for the marathon and cones phases, and we feel really pleased with him.” Weber purchased the horse from Hungarian Four-in-Hand driver József Dobrovitz, Jr. “I had been watching Reno for some time, and he had a great record,” Weber recalled. “Finally, I tested him a bit and drove him in the Beekbergen CAI3* in the Netherlands. We were very competitive there, and I was impressed with him.” The rest was history for the purchase of the horse – and it looks to be a promising beginning to Reno’s future on Team Weber. As Weber and his U.S. team focus on the tournaments ahead, his Four-in-Hand team of Lipizzans that competed with him in Europe remain in France, enjoying a few months of well-deserved vacation time. To stay up to date with the latest happenings for Weber and his talented teams on two continents, visit http://chesterweber.com/ and follow him on Facebook or Instagram.